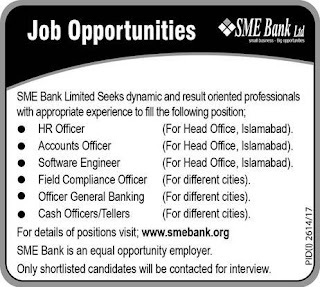 SME Bank Limited intends result oriented professionals with appropriate experience to fill the following positions at different branches/Head Office. Preference will be given to graduates (Business administration / Public Administration in HRM) and having 1-2 years HR experience with a commercial bank. To assist Department Head Accounts in discharging his function on need basis. Tax withholding including sales tax withheld on all payments as applicable. Preparation of timely income and sales tax statement. Payment of tax collected/adjusted in Government Treasury within statutory time period. Experience of working in ERP environment. Handling payments ensuring that these are processed in time, properly supported and approved, Issuance of credit advices to Islamabad Branch for preparation of Pay order/Demand Drafts and their collection from Branch. Handling petty cash payments ensuring that these are properly supported and approved. Handling petty cash, posting of transaction into accounting systems. Timely adjustment of employees advances. Physical handling and safe keeping of petty cash and record. Graduate (Preferable in finance, Commerce, Economics). Preferably 03 year’s experience in similar position with a reputable commercial bank. Analyze the performance of hardware and software interfaces and identify alternatives for optimizing the usage of computer resources. Apply generally accepted programming standards and techniques to assure efficient program logic and data manipulation. Participate in designing, coding, testing, debugging, configuring, and documenting software applications. Conduct Research and Development work within the scope of work. Confer with personnel of organizational units involved to analyze current operational procedures, identify problems, and learn specific input and output requirement such as forms of data input, how data is to be summarized, and formats for reports. Write detailed description of user needs, program functions, and steps required to develop or modify computer program. Study existing information processing systems to evaluate effectiveness and develop new systems to improve production or workflow as required. Responsible for the supervisory and technical work maintaining and updating department or company computer databases. Establish data base administration procedures, set standards, educate system staff on effective programming techniques, and discuss with other System Developers the appropriate design and development applications. Considerable knowledge of computer operations, work simplification techniques, and flow-of-work procedures. Considerable knowledge of the operation, characteristics and capabilities of computer equipment and of the application of such equipment to information processing needs. Ability to prepare system documentation and user manuals to meet user needs. Ability to prepare system designs, work flow plans, report format, input, and output documents adequate to meet user needs. Ability to program, test, and debug programs. Considerable knowledge of systems analysis, systems design, and database architecture. Considerable knowledge of programming techniques. Ability to translate user requirements into a successful information technology application. 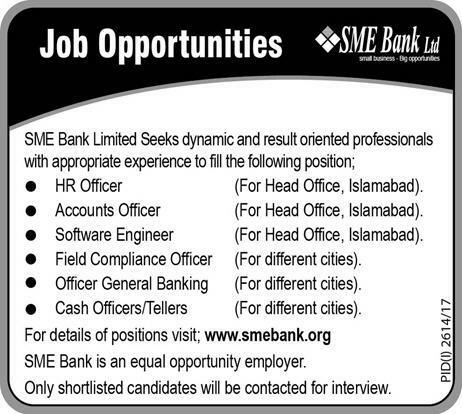 Preference will be given to graduates (Computer Science / Information Technology) and having two year relevant experience with a commercial bank. To ensure SBP regulations and internal policies are thoroughly followed by all concerned. To ensure timeline associated with provision of information are meticulously observed. To coordinate with SBP inspection team in collecting required information/data pertaining to inspection replies. To ensure that information sought by State Bank of Pakistan. To ensure the observations raised by Internal Audit and redressed at branch level. Graduate (Preferable in finance, Banking, Commerce, Economics). Preferably 03 year’s experience in similar position with a reputable commercial bank. Act as the primary contact to deal with customer queries and provide banking related services such as account opening etc. to ensure complete customer satisfaction by facilitating them through the availability of a single point of contact. Graduate, Preferably MBA (Finance or Banking), M.Com, M.A Economics. Preferably 3 years of experience in a similar position with a reputable commercial bank. Preference will be given to graduates (commerce, Business administration) and having one year cash handling experience with a commercial bank. 56-F, Nazim-ud-Din Road, F-6/1, Blue Area, Islamabad.